Could Pierre-Louis Fill Haiti's Leadership Void? President René Préval of Haiti is one odd dude. Imagine that your family was under attack and needed encouragement and courage. Imagine that they needed advice about how to save themselves. Normally one would rush to them, comfort them, show them how to get together to help themselves. But that's not Préval's reaction to the destruction of his country. Instead he walks around with his shoulders down, like a beaten dog. He came out once right after the quake and announced that since his house had fallen, he had nowhere to sleep. What then sounded like a note of solidarity with his destitute people now sounds more like a complaint. Since that memorable utterance he has said nothing at all to the Haitian people and very little else to the international community. One friend of mine who knows him well says it's normal. "René is a nihilist. He loves to contemplate the void." If that's true, he is in luck. Meanwhile, Haitians have to deal with the boulders, the rubble, the dead. The person who should be President of Haiti nearly died the other day. Her injury was not related to the earthquake. She got stung by a bee, and she happens to be allergic. A neighborhood doctor arrived and injected her with an EpiPen. Thus, hope for Haiti's future endures. 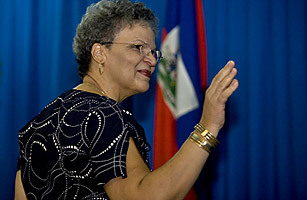 Michèle Pierre-Louis has been around for a long time. She worked with Jean-Bertrand Aristide when he was a parish priest and, later, after he became President. She's a seasoned organizer and grass-roots activist. She's almost pathologically practical. She's on very decent terms with Bill Clinton and George Soros. And most recently she was Prime Minister of Haiti under Préval, until he turned on her and pushed her out of office. They're old friends (that's how Haitian politics works). Pierre-Louis and Préval haven't just run a country together. They also were co-owners of a big and successful bakery. The bakery worked better for the partnership than the country. Bread and politics: When have the two not gone together? Pierre-Louis has energy in a crisis, unlike Préval, who looks like a zombie these days. She does meetings and is attached to her cell phone like other politicians. But she also gets right into the mix and works her connections to get necessary things done  finding tents for her neighbors, trying (not always successfully) to get food to shantytown neighborhoods, connecting the doctor who dealt with her bee sting to a baby who was brought to her with a piece of rebar shoved up her back by the quake, the wound turning gangrenous. "He operated right here in the courtyard with a local anesthetic and, thank God, the operation was a total success," she says. "Next day, no pus. Totally clean." Little things count and will count more as the big money begins to make itself felt and must filter down in useful, peaceful ways to the Haitian people. Someone powerful but with a popular touch would be good, a nice change. Not a fiery populist demagogue, as Aristide once was, but someone who would speak to the people in a time of national emergency, not remain silent and staring. There's enough silence and staring to go around among the victims of this disaster. They don't need more of same from their President. Where's Haiti's Churchill? See a video on the relief effort in Haiti.